The pecan, a dark brown, oblong-shaped nut with a thick husk, is the only nut native to North American. It is a member of the hickory family. Although it’s typically referred to as a nut, botanically speaking, it’s a drupe. A drupe is a fruit with a single pit surrounded by a husk. The United States produces 80% to 95 % of the world’s pecans. Pecan trees grow best in fertile, well drained, medium texture soil. They thrive in areas that have short, cold winters and long, hot summers. The trees can grow over 60 feet high and have trunk diameters in excess of 6 feet. Pecan trees begin to bear nuts when they are six to ten years old. Trees that are 8 to 10 years old typically bear 20 to 60 pounds of nuts. Trees that are 11 to 15 years old can be expected to bear 70 to 100 pounds. When the trees reach 16 years of age, growers can expect to harvest from 100 to 150 pounds of nuts. Trees can produce nuts for as many as 300 years. Pecan trees depend on cool temperatures and frost for successful budding and flower formation. The pecan nuts are harvested in mid October. You may want to make buying bulk pecans a regular part of your shopping routine in order to take advantage of their numerous nutritional benefits. Pecans are one of the top 15 foods revered for their antioxidant activity. They are an excellent source for many of the minerals your body to needs to function at its optimum level. Their high level of manganese makes them a heart healthy snack. The copper found in these tasty nuts helps produce energy. In order to do the things you need to do and want to do, you need to stay healthy. Pecans are a good source of magnesium and zinc, both of which support your immune system. The content of phosphorus, iron, calcium and selenium found in these versatile nuts make them a beneficial addition to your health-conscious diet. Pecans are an excellent source of protein. A 100 gram serving provides 17% RDA of protein. For those looking for a protein alternative to meat, these nuts are a delicious and nutritious alternative. Ten pecans can be eaten as a replacement for a 1 ounce serving of meat. Incorporating pecans into your diet is a great way to get many of the vitamins you need to stay healthy. A 100g serving provides an amazing amount of vitamin E and a good amount of Folates, Niacin, Thiamin, Riboflavin, Pantothenic acid and Pyridoxine. A 1 ounce serving of pecan nuts, which is approximately 20 halves, contains about 200 calories. Instead of depriving yourself of the health benefits and the delicious goodness of this nut, simply commit to enjoying it in moderation. Managing your cholesterol levels is part of a health conscious lifestyle. These nuts are cholesterol free and make a great snack or recipe ingredient for those who are trying to manage their cholesterol levels. Studies show that they can help lower LDL (bad cholesterol) levels. Adding a few of these nuts to your diet can also help maintain desirable levels of good cholesterol known as HDL. 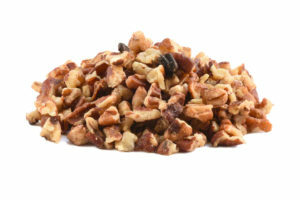 Buying pecans wholesale is a convenient way to add this beneficial nut to your diet. You can get many of the vitamins, minerals and antioxidants your need to live a healthy active life. Many people fail to get the recommended daily requirement of fiber. These nuts are a good source of fiber. Fiber is essential to the proper functioning of digestive system. It helps clean out the gastrointestinal system. This, in turn, reduces the risk of colon cancer, colitis and hemorrhoids. Fiber helps remove toxins from your body. This can lead to healthier, younger looking skin. These nuts also contain antioxidants that fight and eliminate free radicals which can cause premature aging, wrinkles and other skin problems. Pecan nuts are a good source of the minerals calcium and phosphorous which work together to support healthy bones and teeth. Phosphorous is also credited with helping ease the muscle pain that sometimes follows strenuous exercise. Phosphorus is also essential for the growth and repair of cells and tissue. Inflammation has been linked to health issues such as cardiovascular disease, Alzheimer’s disease and arthritis. These nuts are rich in magnesium which is beneficial in reducing inflammation. Magnesium also plays a role in reduces the risk of stroke and in lowering blood pressure. This nut has the unique distinction of contributing a significant amount of gamma tocopherol to the diet. Gamma tocopherol is an important antioxidant revered for the benefits it provides the intestinal system. It is also credited with helping prevent prostate cancer. Not only are pecans beneficial to your physical well-being, they can help protect your mind from some age-related problems. By making a handful of nuts one of your favorite go-to snacks, you can provide some protection to your nervous system. The natural antioxidant vitamin E, can help prevent or delay the progression of Parkinson’s disease, Alzheimer’s and ALS. Pecans can be included in a hearty healthy diet plan because the saturated fat content in pecans is very low and the unsaturated fat in these nuts is considered beneficial to the heart. It’s also important to note that these nuts contain zero trans fats. Being sodium and cholesterol free also makes them a ideal food to include in a heart healthy diet.